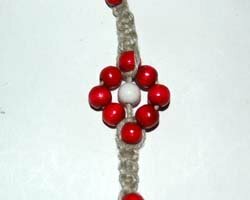 This hemp jewelry craft can be worn as a choker or a bracelet. To make a bracelet, simply braid less length for the first and second step. I love the earthy, nature loving look of hemp jewelry, just perfect for Summer or everyday wear. 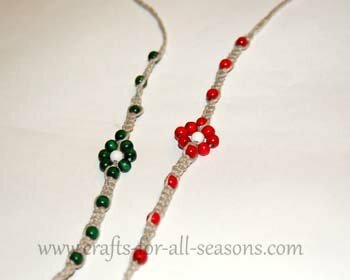 Try making several and grouping them together as bracelets on your wrists. Hemp cording can be found in the jewelry aisle at your local craft store. 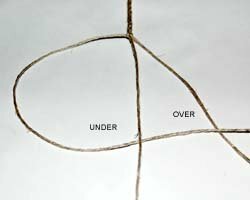 This necklace is very simple to make because you only need to learn how to do one type of knot, the square knot. 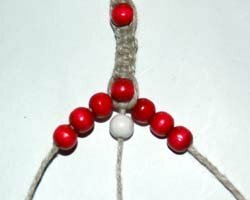 Once you know the knotting pattern, you can turn hemp cord into many different things... like keychains, bookmarks, zipper pulls, etc. All the step by step directions are described below. 1 white or yellow round wood bead (6 mm) for the center of the flower. 1. Cut two pieces of hemp each 1 yard long, and cut a third length 2 feet long. 2. 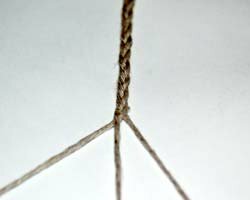 Tie the three pieces of cord together using a simple overhand knot, close to the end. 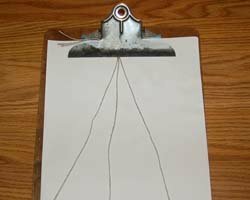 Place the knot under the clip of clipboard. I find this to be a very useful way to keep your work in place while tying the knots. Or, you can purchase a knotting board specifically for this purpose at your local craft store. 3. Braid the three pieces of cord for about four inches. End the braid with the shorter cord in the middle. 4. Next you want to tie one square knot to end the braid. 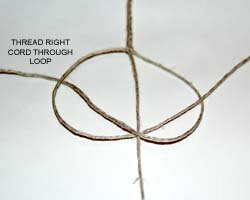 Follow the diagram and photos below which walk you through how to make this square knot. 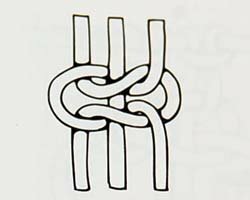 The square knot takes two steps. The first thing to do is take the longer cord on the right and pull it UNDER the center cord, and OVER the left cord. 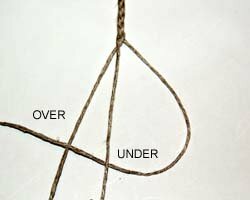 Always remember "under, over". Next, take the cord on the left and thread it through the loop you created. Pull this knot up tight, pulling the center cord (filler cord) tight. For the second step, you repeat this, but this time start with the left cord. Bring the left cord UNDER the center cord, and OVER the right cord. Then thread the right cord through the loop and tighten. 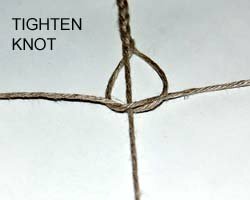 You have just made a square knot. 6. Thread a colored bead on to the center cord. 7. 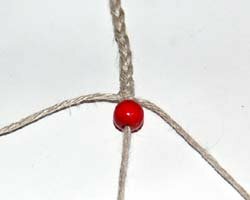 Tie four square knots under the bead. 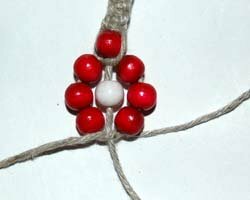 The photo below shows the first knot beginning underneath the bead. 8. Thread on another colored bead, and repeat with four square knots. 9. Repeat step 7 once again. 10. Thread on another colored bead. 11. 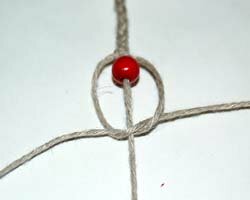 Make a half square knot under this bead. 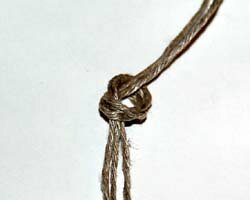 This is done by just following the first step of making a square knot. 12. 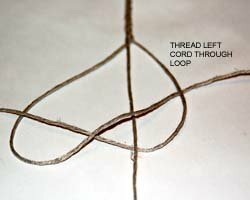 Thread on a white bead on the center cord. On the left and right cords, thread on three colored beads each. 13. Bring the cords back together and make a half knot. This is the center of the choker and forms the flower. 15. To wear your necklace, tie the cords around your neck or wrist in a knot.